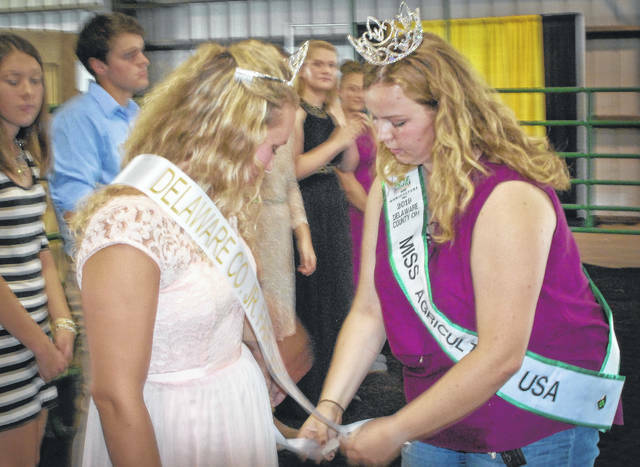 Lauren VanGundy, left, was named the 2018 Delaware County Junior Fair Queen by the Junior Fair Board Saturday afternoon as the 2018 Delaware County Fair got underway. Miss Agriculture USA for Delaware County Bree Vining, right, had the honors of crowning VanGundy and placing a sash around her. In the grand tradition of the Delaware County Fair, Lauren VanGundy was crowned Saturday afternoon as the 2018 Delaware County Junior Fair Queen during a fast-paced ceremony in the Junior Fair Show Arena. The quick pace of the coronation was due to the fact that many of the participants in the royal court were scheduled for livestock shows directly after the ceremony. According to the Junior Fair Board’s adult leadership, participants submitted an application and then were interviewed by the members of the Junior Fair Board. Once all interviews had been conducted, the members of the board voted for a queen, a king, two senior princesses, two junior princesses and a prince. Bree Vining, Miss Agriculture USA for Delaware County, had the honor of crowning and pinning VanGundy’s sash around her. VanGundy said she is currently in her freshman year at Ohio State University Marion. Caleb Mead, a 17-year-old senior in high school, was selected as the 2018 Delaware County Fair Junior Fair King. “It’s a proud honor,” he said. Mead’s older sister, Katlin, was crowned the 2017 Delaware County Junior Fair Queen, but she is currently away at college. She asked him to read a statement about being queen and passing the crown to VanGundy. “I was nervous,” Mead said about reading his sister’s statement to those that gathered at the event. Jonah VanGundy, a prince and freshman at Elgin High School, Marion, said being a prince felt pretty normal. Faith Meyers, one of two senior princesses, said that she was a junior princess last year. However, she isn’t stopping. She’s looking forward to being a queen. Ellen Riley, the other senior princess, said being a princess was a new experience for her, and she has plans to try again next year for queen. “It will be my last year in 4-H next year,” she said. Makenzie Sapp, a junior princess, said she was excited because she thinks it’s going to be a great learning experience. Audrey Gaines said that she was “super excited” to be a junior princess. She said that her plans as a princess are to spread the word about 4-H in hopes of getting more people involved. Jacy Mox, a runner-up, said that she is still planning to run again next year. https://www.delgazette.com/wp-content/uploads/sites/40/2018/09/web1_DSC_3592.jpgLauren VanGundy, left, was named the 2018 Delaware County Junior Fair Queen by the Junior Fair Board Saturday afternoon as the 2018 Delaware County Fair got underway. Miss Agriculture USA for Delaware County Bree Vining, right, had the honors of crowning VanGundy and placing a sash around her.